6pm. 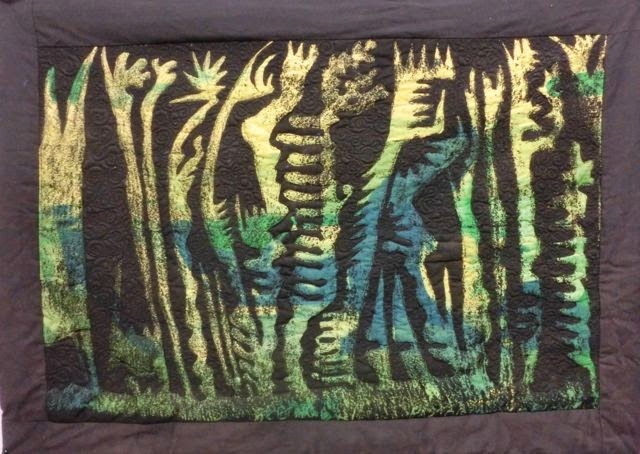 A long long time ago, in a small town in a faraway country…well it was Goulburn in Australia…I screen printed some fabric while at the art school at Goulburn TAFE and turned it into a quilt. 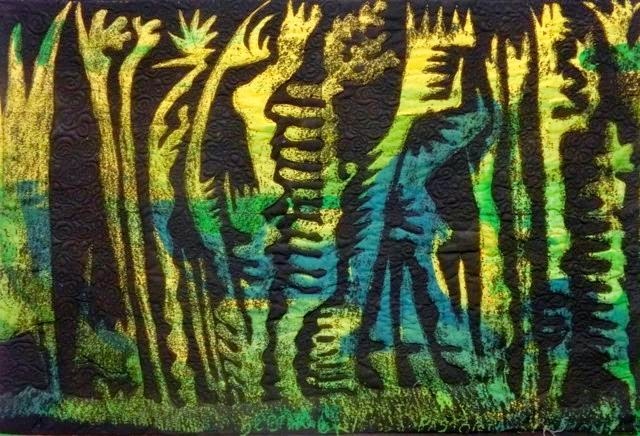 The fabric design was from a drawing which I made whilst listening to a piece of music, in this case it was Beethoven's Pastoral Symphony. As art students it was deemed that we should do music classes and the music students should do art. Both groups hated it at the time but I can see it had merit now. 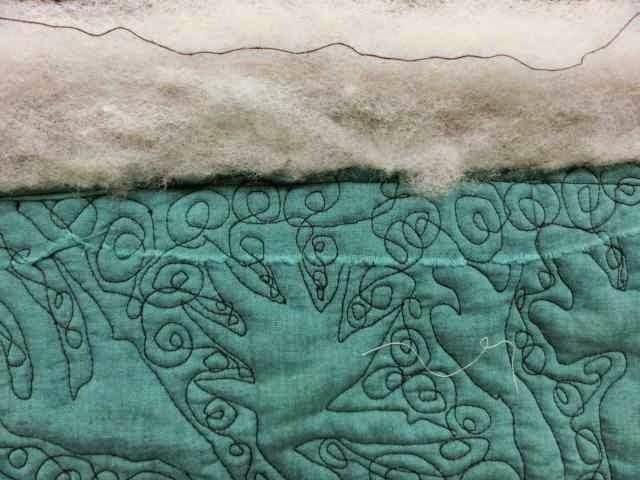 I didn't know how to make a quilt and didn't know how to machine quilt, but I had done a one day class in machine embroidery. - The batting is the fat stuff, the stuff you get sold at Spotlight if you don't know to ask for 'lo-loft'. - I broke about 13 needles, largely because my machine didn't have a darning foot or drop its feed dogs and I used a spring loaded needle. - I didn't know the quilting was supposed to show on the back so I covered it up because there were lots of tucks. 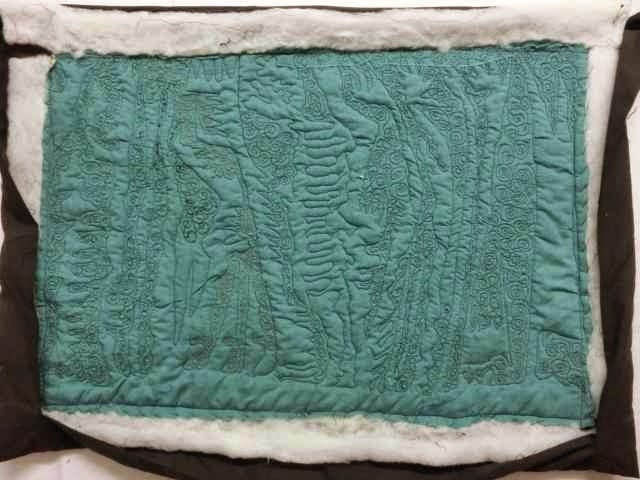 -I must have decided to make the quilt bigger after quilting it, so I had added black borders then tacked extra batting around to make it puffy. -there was no hanging sleeve, I covered the stick with black fabric and attached the stick to the top of the quilt with tacking stitches. Then when I came back to New Zealand, my brother liked it so I gave it to him and recently (well at least 2 years ago) he gave it back because it needed the stick to be re-attached. Today I decided it needed to be updated, the border fabric has faded but the screen printed fabric looks as bright as when it was first printed. 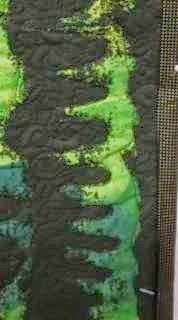 I've unpicked the border which goes right round to the back (told you I didn't know how to quilt). 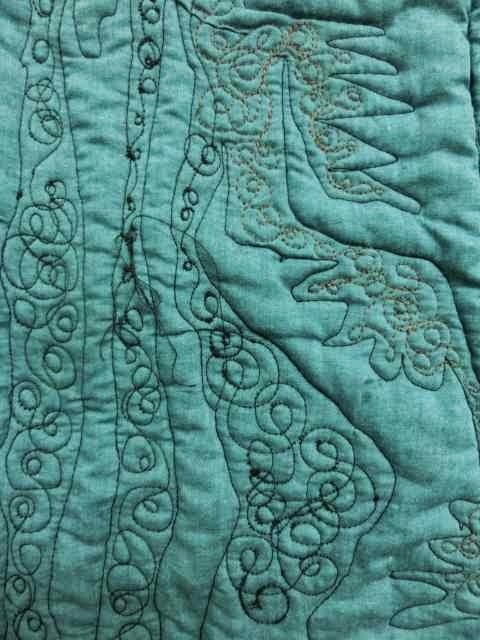 Here are some photos of my machine quilting circa 1999. Note the thick batting , the stuff around the outside was tacked on later, to fill the border. 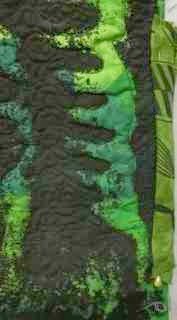 I now teach machine quilting which shows that anyone can improve with practice. 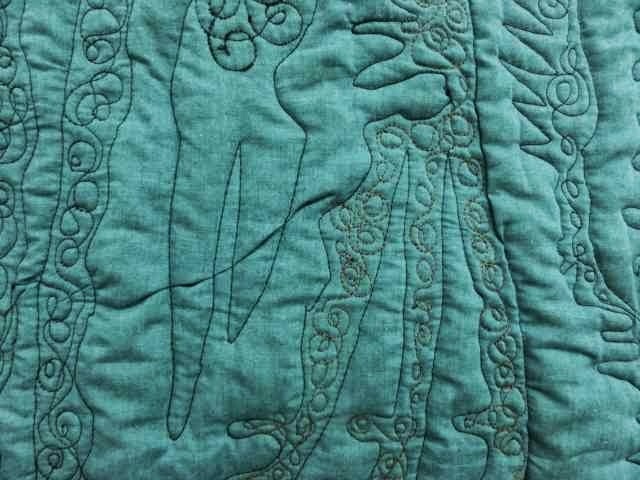 I definitely learnt a lot from that quilt and a few years later, through the internet and talking to other quilters , I learned about lo loft batting, dropped feed dogs, darning feet, and how to avoid coggles and folds. Now , what to bind it with? This is followed by turning the entire room upside down to find a bigger bit of fabric. Now I have decided to do 3 sides in this over dyed fabric (it was black and white once) and the top binding will be black. Hopefully that will work, or if all else fails I will 'face' it which will be hard because the batting is so fat that the fabric won't want to be turned to the back. NB. If anyone is interested in learning more about my Thyroid journey I've made a separate blog. 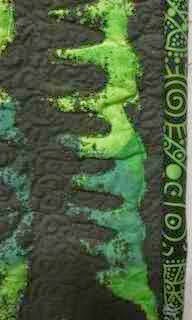 Nice to see you back and fantastic to see how your quilting journey started! I hope you'll take those photos of the back to your next machine quilting class, they'll be a good talking point. Thanks ms Lottie,thats a good idea, although a bit embarrassing, showing all my coggles, tension problems and tucks!